Want something? Get there with #NoExcuses. No Excuses isn’t just the theme of this season of The Biggest Loser (although it did inspire me to cement it as my mantra this year). It’s a choice, it’s a lifestyle, an instruction guide to achieving your goals and dreams. Moreover, it’s not just about fitness, although I’m using it as strong motivation in that arena – it’s a reminder to not let anything stop you from getting to your end goal – whether it’s that new job, landing a date with someone you’re interested in, learning a new skill, or quitting a bad habit. We’re well aware of the excuses. No time. No money. Too afraid. I might fail. They don’t like me. Not skinny enough, not tall enough. Not good enough, smart enough, athletic enough. Well, enough is enough. It’s time to throw out the excuses and pull out all the other idioms (get back on the horse, get back on track, take a leap) that basically mean, get your act together and make something happen for yourself. You want a promotion? Take initiative on a project and blow it out of the water. Tell your boss why you deserve a chance to go bigger and better. You want to lose weight? Get off the couch, and start working up a sweat. You want to eat more healthfully? Buy some fruit and vegetables, and turn down the fries at the happy hour now and then. Drink water or soda or something else instead of alcohol here and there. You want to go on more dates? Ask people on dates. Be dateable. Make the move. Bring something to the table. Tell someone you’re interested. You want to learn something new? Sign up for a class. It can be online, offline, alone, with a group, whatever. Read a book on it, watch a video. Just start practicing. You want to save more money? Talk to a financial planner, make a budget, eat out less and cook more, cut down on the shopping. Start a ROTH IRA and put money into your employer’s retirement fund. You want to travel? Figure out where you want to go, and book the trip. If you can’t find anyone to go with you, go alone. It will change your life. The money will be worth it, so will the time. And so it goes on. I’ve talked about this before – you are the only one standing in the way of your own happiness, and your own success. Everything is a choice. From the moment you get up to the moment you go to bed, it’s your choice what you do, what you eat, who you hang out with, who you choose to love and let love you (yes, really), and where you go. Stop making excuses. Just make something happen. P.S. 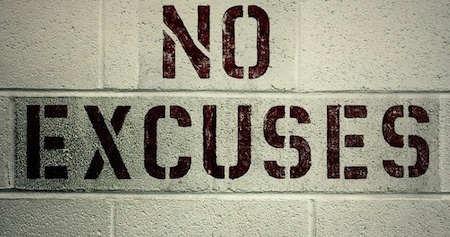 What are you doing in 2012 to live a #noexcuses life? Let me know on twitter @cajunjen.